Finnish and European battery ecosystems were assessed in an extensive study focusing on the current status of the battery industry. The report made for Business Finland by Spinverse in collaboration with Gaia consulting gathered insights of about 130 experts in Finland and Europe, covering the whole value chain from raw materials, cells and batteries to various applications and recycling. The study identified six key areas for potential added value creation and 13 key recommendations for actions for the Finnish battery ecosystem. As batteries are increasingly recognized as key building blocks of the sustainable energy transition and major carmakers are announcing their dedications to electric vehicles, the demand for batteries is booming: The global demand for lithium-ion batteries is estimated to reach 2 TWh by 2040, corresponding to 55 operational 35 GWh gigafactories. While the global competition in the battery market is intense, battery manufacturing capacity needs to be stepped up to ensure energy security and industry competitiveness in European countries. Finland has significant competence and know-how across the battery value chain, especially related to raw materials and chemicals, while major recent developments have also been achieved in battery recycling. Coordinated collaborative efforts are needed to further develop the competitiveness of Finnish battery industry and move further in the value chain to leverage the existing competence in mining, processing and chemicals. A logical next step would be to attract producers of active materials in Finland. “Finland is one of the few countries where all of the key minerals used in the production of lithium-ion batteries are found in the soil, and we possess strong expertise throughout the value chain. This means we have everything needed for the creation of an important battery ecosystem that will help us to create more added value for Finland,” says Petri Peltonen, Under-Secretary of State at the Ministry of Economic Affairs and Employment. The study identified six key ecosystem themes, where additional value can be created in Finland. Prominent opportunities include developing new solutions for large-scale recycling of lithium-ion batteries, battery safety, battery applications for demanding environments and traceability in the battery value chain. Building on top of the existing strengths in raw materials and chemicals as well as battery system engineering is also important for the Finnish battery ecosystem. All battery industry stakeholders agree that environmental and societal sustainability in battery value chain is a prerequisite for sustainable business. This could also be the competitive edge for Finnish and Nordic players. “Transparency and traceability need to be implemented across the battery value chain. Which players will take the leading role in developing concrete solutions for traceability?” asks Timo Ropponen from Spinverse. The importance of battery system management and optimization is emphasized, as battery systems need to fulfil strict requirements for performance and lifetime in various operational environments. “The battery industry needs multi-disciplinary know-how and skills, spanning from materials, electrochemistry and manufacturing processes to system-level engineering. Finland has basically good know-how in these fields, but the resources should be systematically brought together to serve this industry and strengthened a lot. Actually, there is a lack of right competences all over Europe in this growing field. We need smart and fast actions to stay competitive”, says Markku Heino from Spinverse. A national level networking forum coordinated by Business Finland’s ‘Batteries from Finland’ -program or similar should be organized and developed further, while the work should also lead to concrete actions. Active collaboration with other countries is a must in global business, and Nordic countries share similar strengths. The concept of Smart Green Batteries holds attractive opportunities for value creation for the Nordic countries, which should pursue a strong common position and take an active role in developing the required platforms and methodologies. The concept of traceability should be built as an integral part of the Nordic Smart Green battery, and digital tools should be used as means to build competitiveness for the concept. But we should not only stick to the Nordics – the European Commission is actively seeking a European role within the battery industry. Finnish companies should actively engage in this development to strengthen the European value chains. Universities, research institutions and governmental bodies also have a key role as ecosystem partners that may under no circumstances be underestimated. The study was commissioned by Business Finland as a part of Business Finland’s Batteries from Finland activation program, which aims to enhance the growth of knowledge base and global competitiveness in the entire battery value chain. The results of the study were published 28.3.2019 in Helsinki in the seminar “Towards Future Ecosystems for Smart Green Batteries”, which brought together around 120 battery industry representatives from Finland and Europe. 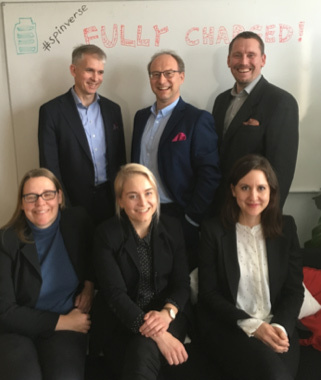 The team of Spinverse experts who participated in carrying out the study included Timo Ropponen, Markku Heino, Juha Riikonen, Satu Ek, Erika Forstén and Maria Rinkkala. Missing from the picture is Jani Adolfsson-Tallqvist.